Jenkins will present “Going to Extremes: Encounters with Earth, Wind and Water” at 5:30 p.m. Tuesday, Aug. 30, in the College of Arts and Sciences auditorium. Music accompaniment will be provided by Lights Along the Shore. The instrumental ensemble, composed of UW Department of Music faculty members, specializes in original compositions and arrangements of classical and folk music from around the world. The program is part of a new initiative known as the UW Institute for Advanced Study (IAS), which is sponsoring a series of events and programs this semester under the theme “Earth, Wind and Water,” says Manuela Hofer-McIntyre, UW Global and Area Studies Program academic coordinating adviser. Jenkins has reported from the most remote regions on Earth. In his presentation, Jenkins reveals through photography and stories his encounters with the planet’s fundamental elements: earth, wind, fire and water. He will first take the audience on an expedition to Mount Everest, which Jenkins summited in 2012. Although still iconic, the mountain of ice and stone has come to symbolize not only great human achievement, but disaster and tragedy, he says. Next, Jenkins choppers into the wildfires of Alaska to illuminate the daring and difficult lives of smokejumpers. Leaping from planes into vast, billowing forest fires, these elite wildland firefighters depend on fickle shifts of wind for survival. 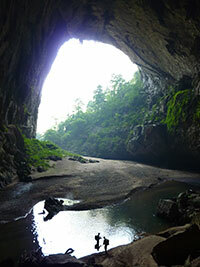 Finally, Jenkins will take the audience with him on an expedition to explore the largest cave in the world, Vietnam’s Hang Son Doong near the infamous Ho Chi Minh trail. Carved by a giant underground river, which itself was formed by pounding monsoonal rains, the cave is so cavernous that entire city blocks could fit inside. The International Education Steering Committee (IESC) sponsors the IAS initiative. The IAS supports and promotes international and interdisciplinary research, knowledge sharing and engagement with the UW community. To learn more about the IAS and IESC, visit www.uwyo.edu/intprograms/ias/partners.html. For a full series of events for the fall semester, go to www.uwyo.edu/intprograms/ias/. For more information, contact Hofer-McIntyre at (307) 766-3415.